To Mr. Lynch's pleasant surprise, the varsity boys basketball team was able to wish him well as the community celebrated his retirement. Bill Lynch retires from the FCSD after a 35 year career ending with his most recent position as Superintendent of Schools for the past 11 years. 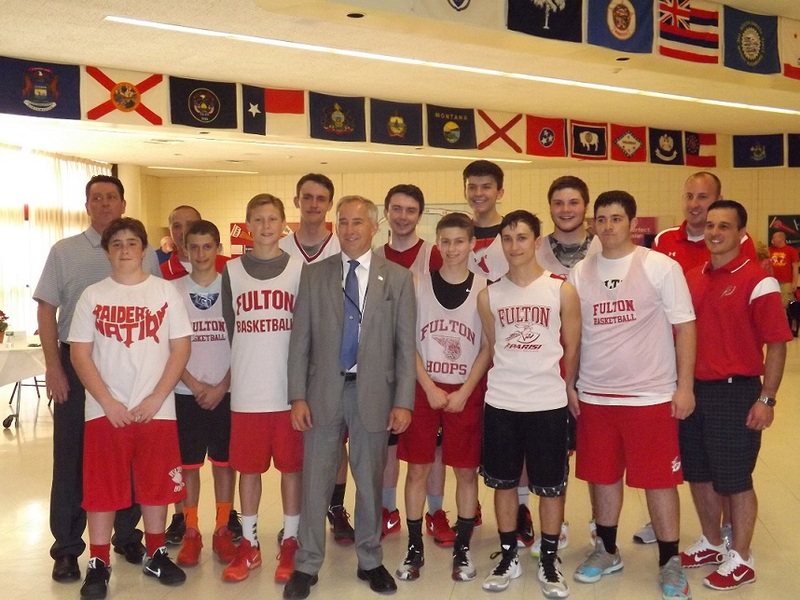 FULTON, NY – Superintendent of schools for the past eleven years, Bill Lynch will soon bring his lengthy position in the Fulton City School District to an end as he enters into a well deserved retirement. Starting work in the district in 1981 as a school psychologist through Oswego County BOCES, Lynch swiftly climbed the ladder of success within the district. 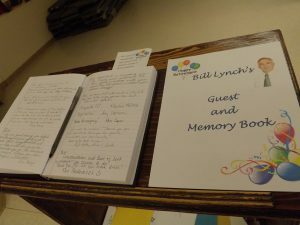 Page after page quickly filled with happy memories and well wishes for retiring superintendent, Bill Lynch. Despite a short break in which he left the area, Lynch continued work in the district under many facets including principal of Granby Elementary School and executive director of instruction and assessment before beginning his 11 year run as superintendent of schools. In those 35 years with the FCSD, Lynch left a legacy that other school officials have described as nothing short of a “powerful impact” on the entire city, focused largely on the best interest of FCSD students and the whole Fulton community. The legacy and impact he will leave behind was recently celebrated by the community at a public open house honoring his approaching retirement effective July 1, 2016. Working for the school district for 29 years herself, Betsy Conner the current executive director of instruction and assessment, recalled the first time she crossed paths with Lynch in the early years of her career with the FCSD when she was a kindergarten teacher and he worked for Oswego County BOCES as the administrator for special education. With classes across the hall from each other, Lynch had suggested the idea of merging classes before such inclusion classes had been created. Former staff, collegues, community members, friends and students flooded the FJHS cafeteria to celebrate Superintendent Lynch’s upcoming retirement. Conners referred to Lynch as “a powerful mentor”, characterizing him as a very influential figure in the district for his years devoted to early development by bringing key people together to focus on this area of learning. Conners estimated that more than 2,200 students have been served through the district’s Universal Pre-Kindergarten Program since it began. 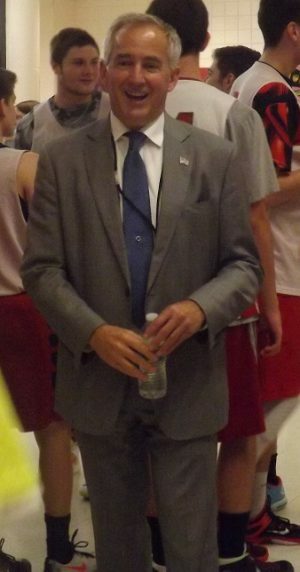 Conners described Lynch in a way that many others at the open house did as well, a district leader whose sole focus was always on the interest of the students and families of the Fulton City School District. “He had such a genuine caring about all of our kids in the district. To Bill (Lynch), this wasn’t just a job, it was who he was. He was representing our kids, families, community, wherever he was,” she said. 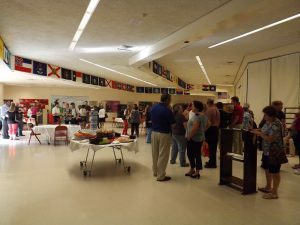 The open house was sponsored by the FCSD Board of Education and organized by board member, Barbara Hubbard. Guests were able to sign a memory book and enjoy refreshments while reminiscing on the many years of service to the Fulton schools that Lynch has devoted to the district. Hubbard has worked with Lynch for more than 20 years of which she has “really enjoyed” the easy nature of his leadership. Aside from his genuine care for the district and community, he had a professional mindset that calmly and efficiently addressed the issues that any superintendent may face. Lynch’s dedication to the Fulton schools and community surely did not go unnoticed by those he may have affected most, the students and parents of the FCSD. One parent, Julie Pawlewicz has sent four daughters through the Fulton district and even without a great deal of direct contact with Lynch as her husband is an active member on the BOE, she was able to see his authentic character firsthand based on the leadership he provided to the district. To Mr. Lynch’s pleasant surprise, the varsity boys basketball team was able to wish him well as the community celebrated his retirement. “He’s the type of guy that would do anything for his students and their families. He was able to get anything solved, any kind of problem, and do it with respect. He’s a people person definitely, very friendly, outgoing, and involved,” she said. Pawlewicz feels it was Lynch’s sociable, active approach to his superintendent position that has enabled him to leave such an impact on the community, a trait she is hopeful the new superintendent will carry over. “It’s important to be out there, that’s the best way you can truly care about the best interest of the ones you’re representing. It’s knowing the names of the students you serve when you see them, just as Mr. Lynch did,” she said. For Lynch, his career has been every bit as enjoyable as it has been demanding. It’s those relationships that Lynch foresees missing the most in his post retirement life. “I’m really going to miss working with the students, their families and the staff of the district. You know, it’s always the people you miss and not so much the things or the stuff. I will miss the opportunity to have an influence on the opportunities we provide our students, on the pathways we create for them to decide where to go in life and how to support them with what they decide,” he said. Of course, the hard working, dedicated core of Superintendent Lynch wouldn’t allow him to fully embrace retirement without some form of continued work to benefit the school district. Bill Lynch retires from the FCSD after 35 years of service in multiple positions including his most recent 11 years as Superintendent of Schools. The grant-funded initiative, P-TECH (Pathways in Technology Early College High School) was accepted for Oswego County schools in October of last year (2015) and allows 50 freshmen representing all nine Oswego County school districts the opportunity to complete a six-year program to earn a New York State Regents Diploma/Regents Diploma with Advanced Designation and a Technical Endorsement and an associate’s degree in electrical engineering technology or mechanical technology from Onondaga Community College. The program partners with local industry leaders to give students an opportunity to earn a high school and associate’s degree while also building business relations with potential employers from local industries. “We are working to put that together, so I will be leading that for a few years. I’m very excited about this program and the opportunities it provides for our students and community businesses,” he said. But mostly, “I’m going to enjoy the opportunity to work directly with our students again,” he said. It’s clear that although Lynch approaches retirement from his long held superintendent position for the FCSD, his role in the Fulton community will not waiver.